Power Performance Enhancement of Underlay Spectrum Sharing in Cognitive Radio Networks Using ESPAR Antenna, ABDALRAZIK, A., SOLIMAN, H., ABDELKADER, M.
An Internet of Things Framework for Remote Monitoring of the HealthCare Parameters, UNGUREAN, I., BREZULIANU, A. An Efficient Deep Learning Algorithm for Fire and Smoke Detection with Limited Data, NAMOZOV, A., CHO, Y. I. A Hybrid Model based on Genetic Algorithm and Space-Filling Curve applied to Optimization of Vehicle Routes, MENDES, W. R., PEREIRA, F. G., CAVALIERI, D. C.
TUDORACHE, T. , BOSTAN, V.
This paper proposes a novel and robust strategy for the optimal design of the drive system integrated in a wind generators test bench. The PI regulator coefficients used in control systems are usually computed based on simplified hypotheses and then tuned manually so as the system response meet certain specifications in terms of stability, accuracy and speed. The proposed methodology permits the automatic identification of PI regulator coefficients using intelligent optimization algorithms, the initial guess for the search procedure being determined based on particular simplified hypotheses. The proposed procedure can help the design engineers to drastically reduce the effort for finding the best PI regulator coefficients offering a range of feasible solutions depending on the imposed optimum criteria. The characteristics and performances of the optimization strategy are highlighted by using it for the design of a DC motor drive system used to simulate the wind prime mover integrated in a wind generators test bench. I. A. Viorel, L. Strete, K. Hameyer, "Construction and Design of a Modular Permanent Magnet Transverse Flux Generator", Advances in Electrical and Computer Engineering Journal, Vol. 10, No. 1, pp. 3-6, 2010. J. Hindmarsh, A. Renfrew, "Electrical Machines and Drives Systems", Butterworth-Heinemann Press, 1997. A. Visioli, "Practical PID Control - Advances in Industrial Control", Springer-Verlag, 2006. W. Levine, "The Control Handbook", CRC Press, 1997. The Mathworks Inc., "Writing S - Functions", Matlab/Simulink Documentation. J. A. Nelder, R. Mead, "A Simplex Method for Function Minimization", The Computer Journal, Vol. 7, No. 4, pp. 308-313, 1965. L. Zhongwei, L. Saojun, D. Yi, Z. Yucai, H. Minghui, D. Yingjian, "Optimization of the Hydraulic Synchronous Control Parameters Based on Simplex Method", Proc. of Control Conference 2007, pp. 527-530, China. 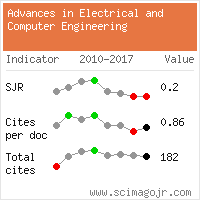 B. Oh, Y. Na, J. Yang, S. Park, J. Nang, J. Kim, "Genetic Algorithm-based Dynamic Vehicle Route Search using Car-to-Car Communication", Advances in Electrical and Computer Engineering Journal, Vol. 10, No. 4, pp. 81-86, 2010. 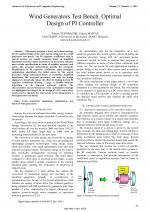 A. Rezazadeh "Genetic Algorithm based Servo System Parameter Estimation during Transients", Advances in Electrical and Computer Engineering Journal, Vol. 10, No. 2, pp. 77-81, 2010. J. Chen, Z. Ren, X. Fan, "A Hybrid Optimized Algorithm Based on Improved Simplex Method and Particle Swarm Optimization", Proc. of Control Conference 2006, pp. 1448-1453, China. Citations for references updated on 2019-04-19 21:09 in 37 seconds. Website conception, design and maintenance by Eugen COCA. Content updated on 28 Feb 2019. Site engine updated on 28 Feb 2019. This page was generated on the server in 0.038 seconds and loaded in your browser in > seconds.